A Powered Parachute (PPC) is a flexible winged, Ultralight. A PPC combines a three or four wheeled cart structure, holding pilot and motor with a large wing similar to those used by parachutists. The wing itself is made of Nylon fabric with suspension lines usually made of Spectra or Kevlar. The thrust from the engine pushes the cart forward and forces air into the leading edge of the wing, causing it to "inflate" and pressurize, thereby keeping the shape designed to fly as an airfoil. Most PPC's use rectangular chutes, but there are new elliptical technology chutes that are changing the way these fly. A Powered Paraglider (PPG) ultralight vehicle is also a flexible winged, ultralight vehicle used for recreational purposes. A PPG Trike combines a three or four wheeled cart structure that holds pilot and motor with a paraglider. While similar to a PPC wing, the Paraglider wing is a higher performance airfoil which can be used for foot launched free flight, and is capable of soaring flight in thermals or ridge lift. Like a PPC, the PPG inflates the wing by moving forward with the thrust from the motor. 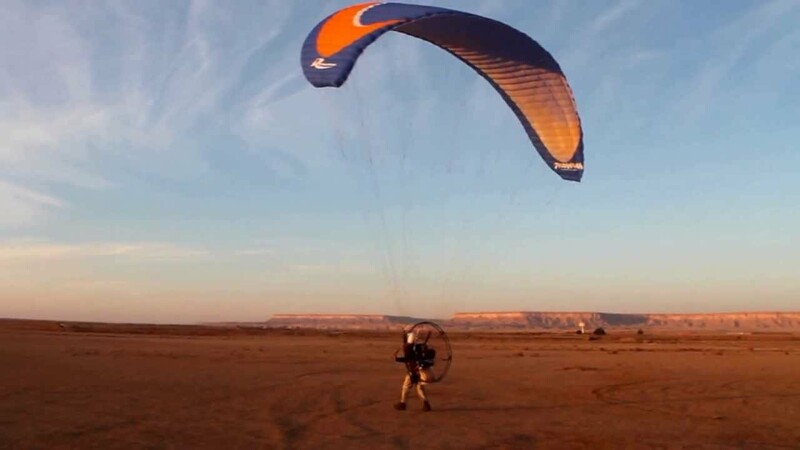 The airfoil shape of the paraglider is maintained in by the forward movement of the Trike through the air.